Daniel Luca Vettori, ONZM (born 27 January 1979) is a New Zealand former cricketer who played for the New Zealand cricket team in all formats and a former captain in all formats. He is the 200th Test cap for New Zealand. He was the captain of New Zealand between 2007 and 2011. Vettori is the eighth player in Test history to take 300 wickets and score 3,000 runs. He is the youngest player to have represented New Zealand in Test cricket, having made his debut in 1996–97 at the age of 18, and New Zealand's most-capped test cricketer with 112 caps, and New Zealand's most capped One-Day cricketer with 284 caps. Vettori was a bowling all-rounder who bowled slow left-arm orthodox spin. An all-rounder is a cricketer who regularly performs well at both batting and bowling. Although all bowlers must bat and quite a few batsmen do bowl occasionally, most players are skilled in only one of the two disciplines and are considered specialists. Some wicket-keepers have the skills of a specialist batsman and have been referred to as all-rounders, but the term wicketkeeper-batsman is more commonly applied to them, even if they are substitute wicketkeepers who also bowl. Left-arm orthodox spin also known as Slow Left Arm Orthodox spin bowling is a type of Left Arm Finger Off spin bowling in the sport of cricket. Left-arm orthodox spin is bowled by a left-arm bowler using the fingers to spin the ball from right to left of the cricket pitch. He is known for his accuracy, flight and guile rather than prodigious turn, and also his speed variation. He has a Test batting average of around 30 which made him one of the more consistent batsmen in the New Zealand cricket team. In the fourth season of Indian Premier League, he was contracted by Royal Challengers Bangalore for US$550,000. The Royal Challengers Bangalore(often abbreviated as RCB) are a franchise cricket team based in Bangalore, Karnataka, that plays in the Indian Premier League (IPL). One of the original eight teams in the IPL, the team has made three final appearances in the IPL, losing all. The team also finished runners-up in the 2011 CLT20, losing the final against the Mumbai Indians. The 2015 Cricket World Cup was the 11th Cricket World Cup, jointly hosted by Australia and New Zealand from 14 February to 29 March 2015. Australia defeated New Zealand by 7 wickets to win their fifth ICC Cricket World Cup. 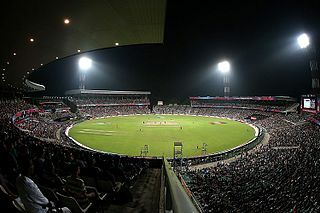 Fourteen teams played 49 matches in 14 venues, with Australia staging 26 games at grounds in Adelaide, Brisbane, Canberra, Hobart, Melbourne, Perth and Sydney while New Zealand hosted 23 games in Auckland, Christchurch, Dunedin, Hamilton, Napier, Nelson and Wellington. He was born in Auckland and brought up in Hamilton, attending Marian School and later St. Paul's Collegiate School, where he started off playing as a medium-pacer, but slowly transitioned into a spinner. When available, he plays provincial cricket for Northern Districts and is also an international member of Indian Premier League team the Royal Challengers Bangalore. Vettori also represents the Brisbane Heat in the Big Bash League. Hamilton is a city in the North Island of New Zealand. It is the seat and most populous city of the Waikato region, with a territorial population of 169,300, the country's fourth most-populous city. Encompassing a land area of about 110 km2 (42 sq mi) on the banks of the Waikato River, Hamilton is part of the wider Hamilton Urban Area, which also encompasses the nearby towns of Ngaruawahia, Te Awamutu and Cambridge. The Brisbane Heat are an Australian men's professional twenty20 cricket team that competes in the Big Bash League. The Heat wears a teal uniform and are based in Brisbane in the Australian state Queensland. Their home ground is the Brisbane Cricket Ground. He is among a very small minority of international sports stars to wear prescription spectacles while playing sport, and only one of very few cricketers in the modern era to play Test cricket with spectacles, others including Zimbabwean Charles Coventry, Australian Chris Rogers, and West Indian Clive Lloyd. Test cricket is the longest form of the sport of cricket and is considered its highest standard. Test matches are played between national representative teams with "Test status", as determined and conferred by the International Cricket Council (ICC). The two teams of 11 players each play a four-innings match, which may last up to five days. It is generally considered the most complete examination of teams' playing ability and endurance. The name Test stems from the long, gruelling match being both mentally and physically testing. Charles Kevin Coventry is a Zimbabwean cricketer. He is a right-handed batsman and occasional wicket-keeper. He previously shared the record, with Saeed Anwar, of the highest individual score in a One Day International, 194 not out. This was surpassed by Sachin Tendulkar's 200 on 24 February 2010. His innings is the highest ODI score in a losing cause, surpassing Matthew Hayden's 181. He is one of only a select few sportsmen to wear prescription spectacles while playing sport. He is currently playing club cricket in Dubai along with fellow Zimbabweans such as Glen Querl and Bradley Staddon. A graph showing Vettori's Test career bowling statistics and how they have varied over time. Vettori has three 10 wicket hauls in Test cricket, against Sri Lanka, Australia and Bangladesh. His best innings figures were achieved at Auckland in 1999–2000 against Australia where he took 7/87. He finished with career best match figures in that game, taking 12/149. They are the second best ever by a New Zealander, with only Richard Hadlee having taken more in a match. With another 12 wicket effort, against Bangladesh in Chittagong, he became the only New Zealander to have taken a dozen wickets in a Test on two occasions. Prior to becoming captain on a permanent basis in 2007, Vettori had captained the Black Caps in ODI cricket on occasions such as when regular captain Stephen Fleming was not available. As of the end of 2006, he had led New Zealand in 11 games, winning eight of them. Vettori stood down from the captaincy and retired from One day Internationals and Twenty20 Internationals after the 2011 World Cup. However, he was called back into the ODI team for the 2013 ICC Champions Trophy.His name is included in the final 15 of the New Zealand team for the 2015 Cricket World Cup to be held in Australia and New Zealand. By that point, he retired from test cricket after his final test match was as an emergency injury cover against Pakistan in November 2014. Vettori matured into a useful lower-order batsman, having scored 4,000 Test runs, including six centuries (110 against Pakistan in 2011, 134 against Pakistan 2009, 140 against Sri Lanka 2009, 138* against Pakistan in 2003, 127 against Zimbabwe in 2005 and 118 against India in 2009) as well as 23 half-centuries. Although it took Vettori 47 Tests to score his first 1,000 runs at an average of 17.24, the second thousand took him just 22 Tests at a rate of 42.52 per innings. In December 2006, Vettori began establishing himself as more of an all-rounder, batting at number 5 for New Zealand in the one-day series against Sri Lanka. On 4 December 2009, despite the Black Caps only scoring 99 runs against Pakistan, Vettori became the highest Test run scorer batting at no.8 spot, a record previously held by Shane Warne. After suffering a dip in form of batting in 2010 Vettori scored a century against Pakistan when he made 110 as New Zealand's lower order resisted to help post a total of 356 all out. Vettori averages a career 30.60 but his average jumps to 57.9 against Pakistan against whom he has three of his six centuries. Deshabandu Sanath Teran Jayasuriya is a former Sri Lankan cricketer and a former captain of the Sri Lankan national team. Considered one of the greatest One Day International (ODI) players of all time, Jayasuriya is well known for his powerful striking and match winning all-round performances in ODI cricket. Jayasuriya is credited for having revolutionized one-day international cricket with his explosive batting with Romesh Kaluwitharana in 1996, which initiated the hard-hitting modern day batting strategy of all nations. Kumar Sangakkara is a Sri Lankan cricket commentator and former cricketer and captain of the Sri Lankan national team. He is widely regarded as one of the world's most influential cricketers and one of the greatest batsmen of all-time. Sangakkara has forged many formidable partnerships with long time teammate and friend, Mahela Jayawardene and holds numerous batting records in the modern era across all formats of the game. He scored 28,016 runs in international cricket across all formats in a career that spanned 15 years. Thilan Thusara Samaraweera is a former Sri Lankan cricketer, who played Tests and ODIs. Samaraweera played international cricket for Sri Lanka as a permanent member in Test squad and is in the side primarily for his solid right-handed batting but is also a capable off spinner. He is the current fielding coach of the Kolkata Knight Riders in the Indian Premier League for 2018. Herath Mudiyanselage Rangana Keerthi Bandara Herath, commonly known as Rangana Herath, is a former Sri Lankan cricketer, who played all forms of the game and a former Test captain for Sri Lanka. Considered as one of the greatest spin bowlers of all time, Herath is the most successful left arm bowler in the Test Cricket history. Abdul Qadir Khan is a former Pakistani international cricketer whose main role was as a leg spin bowler. Later he was a commentator and Chief Selector of the Pakistan Cricket Board, from which post he resigned because of differences with the top brass of Pakistan cricket. Qadir appeared in 67 Test and 104 One Day International (ODI) matches between 1977 and 1993, and captained the Pakistan cricket team in five ODIs. In Test cricket, his best performance for a series was 30 wickets for 437 runs, in three test matches at home, against England in 1987. His best bowling figures for an innings were nine wickets for 56 against the same team at the Gaddafi Stadium in the same series in 1987. In ODIs, his best bowling figures were five wickets for 44 runs against Sri Lanka during the 1983 Cricket World Cup. He was a member of the Pakistani team in the 1983 and 1987 Cricket World Cups. Yahoo! Cricket described Qadir as "a master of the leg-spin" who "mastered the googlies, the flippers, the leg-breaks and the topspins." He is widely regarded as a top spin bowler of his generation and was included in Richie Benaud's Greatest XI shortlist of an imaginary cricket team from the best players available from all countries and eras. Former English captain Graham Gooch said that "Qadir was even finer than Shane Warne". Denagamage Praboth Mahela de Silva Jayawardene, known as Mahela Jayawardene, is a Sri Lankan cricket coach and former cricketer. He is regarded as one of the modern greats of batsmanship, especially due to his mastery of playing spin bowling. Jayawardene's highest test score, 374 against South Africa is the highest test score by a right handed batsman in the history of test cricket. Luteru Ross Poutoa Lote Taylor is a New Zealand cricketer, who plays predominantly at number four in all formats of the game. Taylor is considered as one of the greatest batsmen to represent New Zealand and became the nation's highest ODI century maker surpassing Nathan Astle, on 22 February 2017, with his 17th ODI century. Alexander Graeme Cremer is a Zimbabwean cricketer and was the captain of the Zimbabwe national cricket team, following the sacking of Hamilton Masakadza in May 2016. However, in March 2018 he was sacked as the team captain, after Zimbabwe failed to qualify for the 2019 Cricket World Cup in the 2018 Cricket World Cup Qualifier. He is a leg-spinner who got into the Zimbabwe side at the age of eighteen, following the exits of Paul Strang, Andy Whittall and Ray Price from the Zimbabwean team. Jeetan Shashi Patel is a former New Zealand international cricketer who played all forms of the game. A right arm off spin bowler, he plays county cricket for Warwickshire in England, and represents the Wellington Firebirds in New Zealand. Chamara Kantha Kapugedera, commonly Chamara Kapugedera is a professional Sri Lankan cricketer who plays limited over internationals, and a former ODI captain. He was a permanent member in the national team from the debut match to until 2010, and finally poor performances dropped him from the squad, until comeback in 2015. He is an alumnus of Dharmaraja College, Kandy. Timothy Grant Southee is a New Zealand international cricketer who plays all forms of the game. He is a right-arm fast-medium bowler and a hard-hitting lower order batsman. He is also the current vice-captain of the international team. He was one of New Zealand's youngest cricketer, debuting at the age of 19 in February 2008. On his Test debut against England he took 5 wickets and made 77 off 40 balls in the second innings. He plays for Northern Districts in the Plunket Shield, Ford Trophy and Super Smash as well as Northland in the Hawke Cup. He was named as New Zealand's captain for the first T20I against West Indies in place of Kane Williamson, who was rested for that game. Blackcaps won that match by 47 runs. Umar Akmal is a Pakistani cricketer. He made his ODI debut on 1 August 2009 against Sri Lanka and made his Test debut against New Zealand on 23 November 2009. He is a right-handed batsman and a part-time spinner. Like his two brothers, Adnan and Kamran, Umar has kept wicket for the national team in many ODIs. His wife's name is Noor Fatima. The Indian cricket team toured New Zealand from 25 February to 7 April 2009, playing a Test match series with New Zealand for the first time in five years. The tour included three Tests, five ODIs and two T20Is. New Zealand won both the T20Is. India won both the ODI series 3–1 and Test series 1–0. Ranasinghe Arachchige Suranga Lakmal, commonly Suranga Lakmal, is a professional Sri Lankan cricketer, who plays in all formats of the game and is a former Test cricket captain. He is a right-arm fast bowler and right-handed batsman. He started his cricket life in Debarawewa National School, Tissamaharama. He was first included in the national squad for the tour of Pakistan in 2008-2009 and was reported to have been injured in the attack on the Sri Lankan team by terrorists. Narangoda Liyanaarachchilage Thisara Chirantha Perera,(Sinhalese: තිසර පෙරේරා; born 3 April 1989), popularly as Thisara Perera, is a professional Sri Lankan cricketer and a former limited overs captain for Sri Lanka, who currently represents Sri Lanka in limited over formats. Domestically he plays for Colts Cricket Club, Rising Pune Supergiants, Wayamba Wolves, and have recently joined Gloucestershire squad to play NatWest T20 Blast. Primarily a bowling all-rounder, he is an aggressive left-handed batsman who can hit big sixes in death overs and is a useful right-arm medium-fast bowler. Deshabandu Pinnaduwage Aravinda de Silva is a former Sri Lankan cricketer and former captain. He has also played in English County cricket. Widely considered as one of the best batsmen ever produced by Sri Lanka, De Silva helped Sri Lanka to win the 1996 Cricket World Cup and brought Sri Lanka from underdog status to present day form. 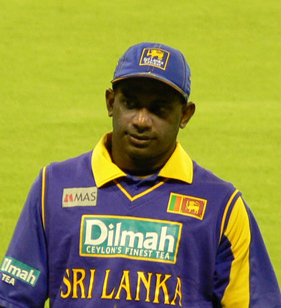 He has held various posts in Sri Lanka Cricket after his retirement in 2003. The Sri Lankan national cricket team toured New Zealand from 26 December 2014 to 29 January 2015 for a tour consisting of two Test matches and seven One Day Internationals. New Zealand won the Test series 2–0 and the ODI series 4–2. ↑ "Vettori confident of fruitful outing". Deccan Herald. 2 April 2012. ↑ "New Zealand's Daniel Vettori retires from international cricket". BBC Sport. BBC Sport. 31 March 2015. Retrieved 31 March 2015. ↑ Ackerman, Sam (27 August 2009). "Vettori joins cricket's elite 300 wicket, 3,000 run club". 3 News. Retrieved 27 August 2009. ↑ "Records / New Zealand / One-Day Internationals / Most wickets". Cricinfo. Retrieved 27 August 2009. ↑ "Sri Lanka vs Bangladesh, 1st Test: Rangana Herath surpassed Daniel Vettori's world record". AFP via Firstpost. 11 March 2017. ↑ "Vettori's interesting records and facts". cricket country. Retrieved 3 March 2017. ↑ "Scorecard: New Zealand v Pakistan, 1st Test at Dunedin, 24–28 November 2009". Cricinfo. Retrieved 6 December 2009. ↑ "Most runs at each batting position". Howstat. Retrieved 17 March 2017. ↑ "Most hundreds at each batting position". Howstat. Retrieved 17 March 2017. ↑ Leggat, David (10 August 2007). "Vettori for captain as Fleming hits 145". The New Zealand Herald. Retrieved 27 August 2009. ↑ "Changing of the guard for Black Caps". TVNZ. 12 September 2007. Retrieved 27 August 2009. ↑ "NZ snub England". The Sydney Morning Herald. 26 June 2008. Retrieved 27 August 2009. ↑ Grant Elliott in, Jimmy Neesham out for New Zealand | Cricket. ESPNcricinfo (8 January 2015). Retrieved on 2018-05-27. ↑ New Zealand v Pakistan: Daniel Vettori dazzles with ton on batsmen's day | Cricket. ESPNcricinfo (16 January 2011). Retrieved on 2018-05-27. ↑ "MCC v Rest of the World – 5 July". Lord's. 5 July 2014. Archived from the original on 7 July 2014. Retrieved 5 July 2014. ↑ "Daniel Vettori's parents remember his Test debut and the days before it". ESPN Cricinfo. Retrieved 25 May 2013. ↑ "Daniel Vettori Profile". Blackcaps. Retrieved 25 May 2013. ↑ "Vettori to marry girlfriend, move to Auckland". The New Zealand Herald. 6 May 2007. Retrieved 27 August 2009. ↑ "What the Kiwi gossip mags say". stuff.co.nz. 7 April 2009. Retrieved 27 August 2009. ↑ "Baby boy for Vettori". The New Zealand Herald. 9 March 2009. Retrieved 27 August 2009. ↑ "The Queen's Birthday Honours 2011". Department of the Prime Minister and Cabinet . 6 June 2011. Retrieved 6 June 2011. ↑ "'I had two cups of tea in my hands and they were shaking'". ESPNcricinfo. 26 March 2010. Retrieved 31 January 2012. ↑ Statsguru: Daniel Vettori, Cricinfo, 12 March 2010. ↑ "New Zealand in England Test Series, 2008". ESPNcricinfo. 8 June 2008. Retrieved 20 March 2015. ↑ "New Zealand in Bangladesh Test Series, 2008/09". ESPNcricinfo. 29 October 2008. Retrieved 20 March 2015. ↑ "Sri Lanka in New Zealand Test Series, 1996/97 – New Zealand v Sri Lanka Scorecard". ESPNcricinfo. 17 March 1997. Retrieved 20 March 2015. ↑ "Trans-Tasman Trophy, 1999/00 – New Zealand v Australia Scorecard". ESPNcricinfo. 15 March 2000. Retrieved 20 March 2015. ↑ "Trans-Tasman Trophy, 2001/02 – Australia v New Zealand Scorecard". ESPNcricinfo. 4 December 2001. Retrieved 20 March 2015. ↑ "New Zealand in Zimbabwe Test Series, 2005 – Zimbabwe v New Zealand Scorecard". ESPNcricinfo. 8 August 2005. Retrieved 20 March 2015. ↑ "Bangladesh in New Zealand Test Series, 2007/08 – New Zealand v Bangladesh Scorecard". ESPNcricinfo. 14 January 2008. Retrieved 20 March 2015. ↑ "New Zealand in England Test Series, 2008 – England v New Zealand Scorecard". ESPNcricinfo. 19 May 2008. Retrieved 20 March 2015. ↑ "New Zealand in Bangladesh Test Series, 2008/09 – Bangladesh v New Zealand Scorecard". ESPNcricinfo. 21 October 2008. Retrieved 20 March 2015. ↑ "New Zealand in Bangladesh Test Series, 2008/09 – Bangladesh v New Zealand Scorecard". ESPNcricinfo. 29 October 2008. Retrieved 20 March 2015. ↑ "Pakistan in New Zealand Test Series, 2009/10 – New Zealand v Pakistan Scorecard". ESPNcricinfo. 15 December 2009. Retrieved 21 March 2015. ↑ "New Zealand in Zimbabwe Test Match, 2011/12 – Zimbabwe v New Zealand Scorecard". ESPNcricinfo. 5 November 2011. Retrieved 21 March 2015. ↑ "Chappell-Hadlee Trophy, 2004/05". ESPNcricinfo. 10 December 2004. Retrieved 21 March 2015. ↑ "Zimbabwe in New Zealand ODI Series, 1997/98 – New Zealand v Zimbabwe Scorecard". ESPNcricinfo. 8 March 1998. Retrieved 21 March 2015. ↑ "West Indies in New Zealand ODI Series, 1999/00 – New Zealand v West Indies Scorecard". ESPNcricinfo. 4 January 2000. Retrieved 21 March 2015. ↑ "Bank Alfalah Cup, 2003 – Sri Lanka v New Zealand Scorecard". ESPNcricinfo. 19 May 2003. Retrieved 21 March 2015. ↑ "NatWest Series, 2004 – New Zealand v West Indies Scorecard". ESPNcricinfo. 10 July 2004. Retrieved 21 March 2015. ↑ "West Indies in New Zealand ODI Series, 2005/06 – New Zealand v West Indies Scorecard". ESPNcricinfo. 22 February 2006. Retrieved 21 March 2015. ↑ "Bangladesh in New Zealand ODI Series, 2007/08 – New Zealand v Bangladesh Scorecard". ESPNcricinfo. 31 December 2007. Retrieved 21 March 2015. ↑ "West Indies in New Zealand ODI Series, 2008/09 – New Zealand v West Indies Scorecard". ESPNcricinfo. 7 January 2009. Retrieved 21 March 2015. ↑ "ICC Champions Trophy, 2009/10 – New Zealand v Sri Lanka Scorecard". ESPNcricinfo. 27 September 2009. Retrieved 21 March 2015. ↑ "ICC Champions Trophy, 2009/10 – New Zealand v Pakistan Scorecard". ESPNcricinfo. 3 October 2009. Retrieved 21 March 2015. ↑ "Chappell-Hadlee Trophy, 2009/10 – New Zealand v Australia Scorecard". ESPNcricinfo. 6 March 2010. Retrieved 21 March 2015. ↑ "ICC Cricket World Cup, 2014/15 – New Zealand v Afghanistan Scorecard". ESPNcricinfo. 8 March 2015. Retrieved 21 March 2015. ↑ "New Zealand v Sri Lanka T20I Series, 2010 Scorecard". ESPNcricinfo. 23 May 2010. Retrieved 21 March 2015. ↑ "ICC World Twenty20, 2007/08 – India v New Zealand Scorecard". ESPNcricinfo. 16 September 2007. Retrieved 21 March 2015. ↑ "New Zealand in Sri Lanka T20I Series, 2009 – Sri Lanka v New Zealand Scorecard". ESPNcricinfo. 2 September 2009. Retrieved 21 March 2015. ↑ "Bangladesh in New Zealand T20I Match, 2009/10 – New Zealand v Bangladesh Scorecard". ESPNcricinfo. 3 February 2010. Retrieved 21 March 2015. Wikimedia Commons has media related to Daniel Vettori . Daryl Tuffey and Andy McKay were called in as a replacements for Hamish Bennett and Kyle Mills respectively. * Henry replaced Milne in the squad.